Also known as Holywell Castle and Bryn-y-Castell. Ordnance Survey map reference SJ 186 763. The Oxford History of England and Flintshire County Council. 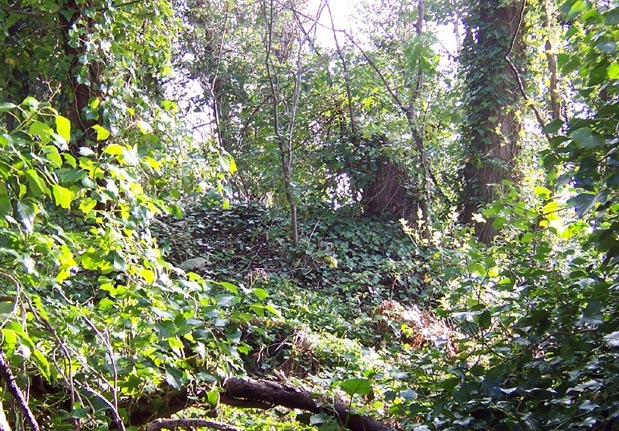 Above: The north western edge of the castle mound. A Holy Well lies at the bottom of a steep bank to the right. The modest earthwork castle at Basingwerk was probably built by the Normans in the eleventh or early twelfth century within an earlier Saxon fortress. The motte overlooks the Holy Well of St Winefride, which is directly below the castle's western side, and may have been built to protect the lucrative Pilgrim trade that the well sustained. 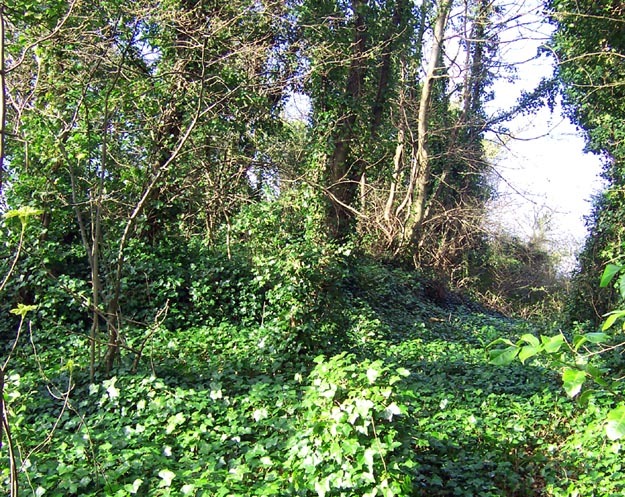 The eastern side of the overgrown motte, looking north across the bailey. The castle occupied the end of a narrow and naturally strong promontory about one mile south of the Dee estuary, roughly mid-way between Chester and Rhuddlan. 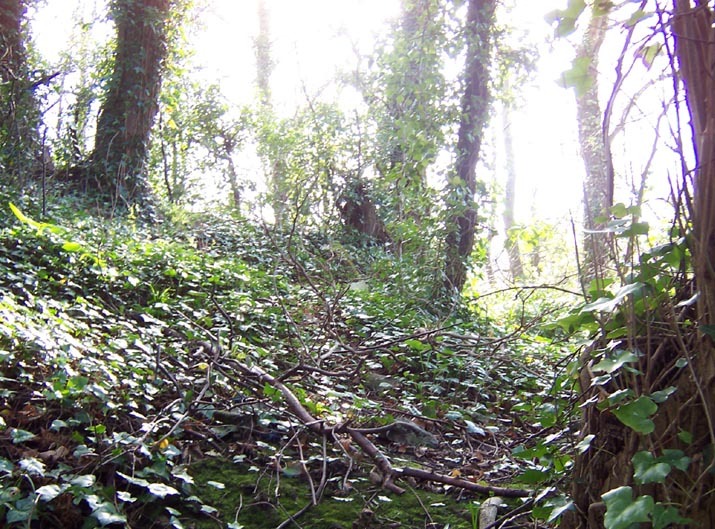 A broad ditch at the southern end of the castle cut off the tip of the steeply-sided promontory and a low motte, around 6 metres high and 8 metres diameter at the top, was built on the west side of the enclosed bailey. There are some remains of weak stonework but it's not clear if they were part of the castle or were added later when cottages (now demolished) occupied the site. 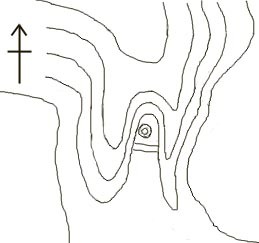 Sketch map of the castle layout, not to scale. 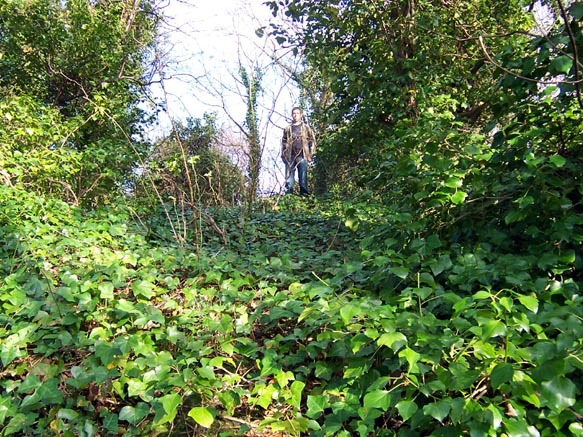 The eroded earthworks are badly overgrown but the site can be glimpsed through the trees from the footpath that runs down from the town to Basingwerk abbey, on the other side of the promontory to the Well Church. However, it's best to do this in the winter before the castle is shrouded in foliage. 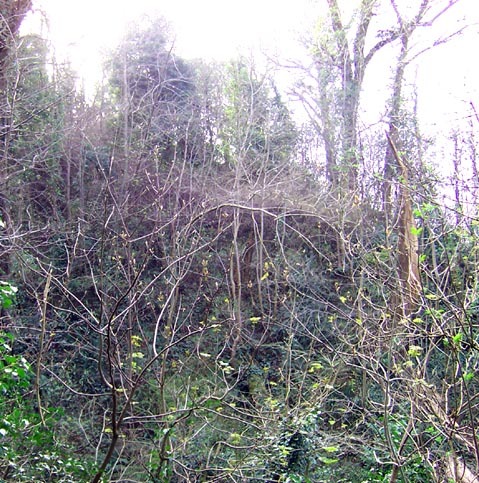 The castle hill from the east, looking across a dry ravine. The castle changed hands several times during the territorial struggles that took place between Welsh princes and Norman rulers, before being eclipsed by larger stone castles that were more difficult to besiege. The motte from the northern part of the bailey. 8th century - Basingwerk was a Saxon frontier stronghold at the northern end of Watts Dyke (the dyke was built by King Aethelbald to protect Mercia after serious Welsh raids in 705 and 709 AD). Before 1155 - The earth and timber castle at Basingwerk was destroyed during King Stephen's reign. 1157 - The castle was rebuilt by Henry II, who stayed there while visiting the Holy Well. 1165 - Besieged by Owain Gwynedd in response to an invasion by Henry II, following Owain's eastward expansion of Gwynedd. 1166 - Captured by Owain following Henry II's failure to advance past the Berwyn Mountains. 1177 - Basingwerk was held by Dafydd ap Owain, who also held Rhuddlan, Degannwy and perhaps Pentrefoelas. 1209 - Burnt by Ranulf III, Earl of Chester, after complaints from the monks of Chester that they had lost the Well Church during the wars with the Welsh Princes. Ranulf had the castle rebuilt to protect the many pilgrims to the Well Church. Before 1240 - Taken by Llywelyn ap Iorwerth during the expansion of Gwynedd, when England was politically weak in the time of King John. 1240 - The castle was inherited by Dafydd ap Llywelyn after his father's death and he confirmed the monks of Basingwerk in their possession of the Well Church. 1241 - Basingwerk was given by Dafydd ap Llywelyn to Henry III, along with many of the possessions that had been gained by Llywelyn, as part of a peace treaty agreed after Henry's opportunistic invasion of north east Wales. 1277 - The site ceased to have any strategic importance following the construction of a new stone castle at nearby Flint by Edward I. Looking up the the western slope of the castle earthworks, above the Well Church.